Swami always says “Butter Milk is Better Milk”. Butter milk is both delicious and healthy. It is a great way to cool off when the heat is unbearable. 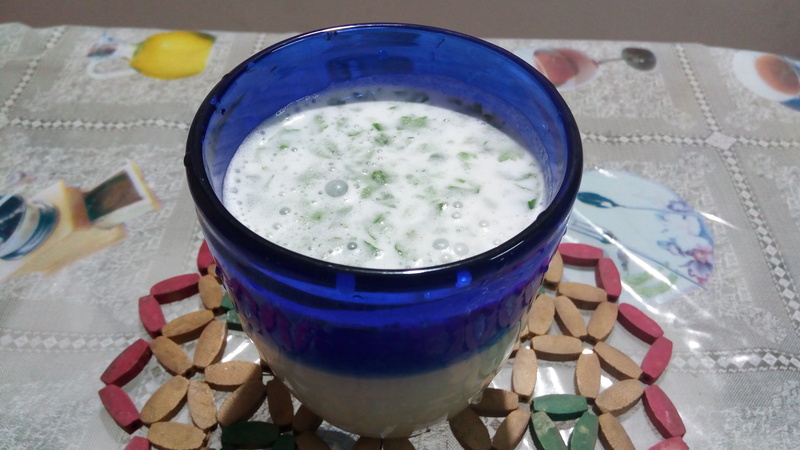 This drink helps to heal acidity, soothes the stomach after spicy meal, improves digestion, improves calcium intake, washes down fats, lowers cholesterol, reduces blood pressure and prevents cancer, contains several other nutrients apart from calcium. Transfer the curd into a jar. Add Asefoetida (Hing), water and salt. Mix well. Sprinkle chopped coriander leaves and serve in a glass. Can we keep this in the fridge? Or must we make a smaller quantity? Better to make smaller quantity and have. This helps our body to absorb the good bacteria in buttermilk. But unavoidable situations butter milk can be stored in the fridge for one day.